Release your frustration and tension with this dollar sign stress ball, dubbed A Dollar in Distress. 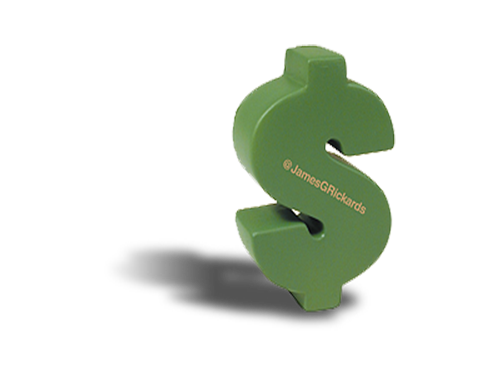 A great office prop that will be very useful on those lengthy conference calls, each dollar has James’ twitter handle @JamesGRickards printed in gold. Complimentary with each purchase while supplies last. Fractal: A natural phenomenon or a mathematical set that exhibits a repeating pattern that displays at every scale – such as a snowflake. A defining characteristic of a fractal is that the smaller parts are just miniature versions of the bigger parts. Taken separately and viewed at the same scale, you cannot tell them apart.